I feel like I have been hurtling through 2018. Several personal and business trips kept me on the road more than usual, and then I have been playing catch up when I am back in the office. But, there is some light on the horizon. Just a couple more events that are going to be lots of fun and then a week of vacation to cap off the month. But even in the midst of all the busy-ness including heading into the overlap between the spring and summer semesters of my online course, I woke up to a lull today. I certainly had a to do list but nothing on it was pressing. I answered a few emails, did two phone meetings in the morning, and then decided everything else could wait until tomorrow or over the weekend. I needed some breathing space and took advantage of a nice day to dig in the garden, moving a few hostas and sweet william and doing some general cleanup. I call this a lifeskill–the ability to know when to work and when, even though it is a Thursday afternoon, you can put aside work for a bit of a break. I think it’s one that is hard to learn in a classroom or regular job. Working from home as part of the gig economy means tuning into the natural ebb and flow of work rather than following an established number of hours each day, otherwise known as seat time. You can create a daily routine that matches your preferences for when and where to work. From there, you may find a weekly routine (established events or activities) or identify a yearly pattern (ie, busy in the fall teaching a course with less work in the summer). Why is this important? Because if you don’t identify these moments of “lull,” you will just keep working. At some point, nothing on the to do list is on fire or a live frog or any other kind of emergency so you can put it aside for a few hours or a day. A mental health day or mini-vacation. Even the most passionate person needs time to be away from the work, maybe pursuing some other passion or finding space for relaxation. Today I enjoyed a lull, and I’ll be better for it tomorrow. I write a fair amount about living a life outside the traditional workforce. One lesson I continue to learn about living this life is that it flows and living in rather than fighting the flow is the way to move smoothly and calmly even through the rapids. I was the road warrior in June: just take a look at my reading log. I hit a high of 13 books because I discovered The 39 Clues series on Audible. Each book takes about 4-1/2 hours of listening, which just happened to be the average length of each of my car trips. Every day was planned to the minute as each task had to be completed on time if events and trips were going to be successful. There was no time for procrastination. Within that strict regimen there was “work” and “life” as even my garden was part of the to do list. Weeding had to be done before I was gone for ten days. That meant a daylong marathon with shovel and cart. My husband shepherded me inside at dusk, handing me two ibuprofen as I walked up the steps. And now…it’s July, and for the first time in many years, I am home. No traveling, no training, even very little “work.” My mother was worried that I was going to be bored and suggested I could use the free time to house clean. 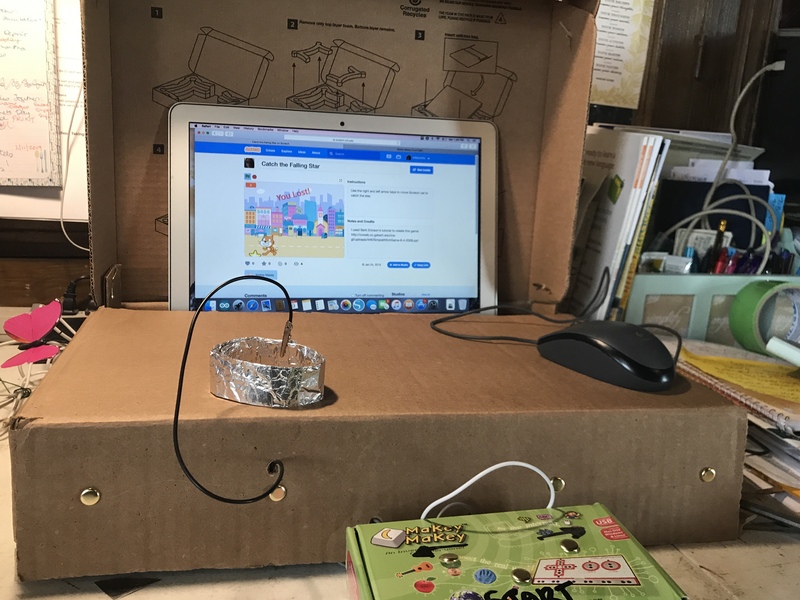 I’m thinking more Scratch programming and Raspberry Pi exploration along with early morning hours in the garden and long afternoons floating in the pool with a book. As my summer rolls on I will honor my love of learning, my love for my family, my love for my profession and my curiosity of the world. My life cycle flows with this balance all year long. You see, I am a 12-month mother. I am a 12-month wife. I am a 12-month friend. I am a 12-month teacher. I am a 12-month human. I never take a vacation from any of those parts of me. Some parts just come out a little stronger at times but all contribute to balancing me as a whole. I think the struggle is figuring out which part is stronger at any time as I tend to want to always focus on the work I do for others first. I resonated with Donna sitting on the porch with her hummingbirds–mine are at their height right now, buzzing me as I head out to fill the feeders–reviewing her notes from a summer workshop. For me, it would be planning ahead for my fall courses and events. Then, I sat down at the laptop this morning prepared to put in a full morning of work and realized I didn’t have to…I could browse Twitter and that led to Tamara’s tweet and Donna’s post and some writing. It’s a different kind of work this personal reflection and community connection, and who knows where it might lead. The emails will wait; the preparation for an October workshop will wait; it’s time for the focus to be on my own learning and growing and flowing. There has, as you can imagine, been lots of talk about snow days here in the Commonwealth. Jon Becker mused about how odd it seemed to have a university close despite widespread connectivity. He asked a powerful question: “Are we not supposed to work?” The comments provided examples of both K-12 and higher education organizations that managed to continue work and learning despite not being able to physically meet. My own comment was bit tongue in cheek: I teach online for two universities that were both officially closed. Our learning went on as usual. If my students, most of whom were themselves out on snow days, chose not to work on the days the schools were closed, that is up to them. I suspect, however, most of them used the time to get caught up. I wonder why there was a fall off in participation? The novelty wore off? The sense of community was reduced? Or, did students have a sense that the work didn’t count? The edict that there would be “no e-learning today” reminded me of Jon’s tweet: an educator is banning learning? What if they wanted to continue? K-12 educators seem torn about snow days and formal learning. In a tweet chat last evening, the topic, not surprisingly, was snow day learning. Some teachers felt like these days should be breaks for the kids: have fun in the snow, hang out with family, and just take a break from the rigors of school. Others indicated they had communicated with their students and parents, sharing ideas for how to keep the learning going despite being out of school, whether it was encouraging elementary kids to read or high school kids to apply their physics learning to snow. As with the students and teachers in Indiana, there were some constraints. Not all students had Internet access and even for those who did, accessing the school ecosystem could be difficult on a non-school device. Some questioned the use of non-school communication systems like Twitter as being against the AUP. And, ultimately, making kids and teachers work on a day off still didn’t make the day “count” towards state attendance requirements so there was a sense that it was all just optional. That last problem underscores the disconnect between bureaucracy and technology as the latter moves much more quickly than the former. Ultimately, if snow day learning is going to catch on in K-12 at least, bureaucracy is going to need to catch up. I had something of a revelation over the course of the past few days: I am NOT taking full advantage of the tools I am using to make my life easier. Somehow, I have gotten stuck at a somewhat superficial level of use: I use the tools but they don’t work for me. My main teacher was Tim Owens. I approached him with a question about the CSS for this blog. By the end of solving that problem I had learned that I no longer had to ctrl-click to get the menu, that I could use Chrome’s Developer view to not only view but link to the problematic code, and that it was worth using the CSS file to customize my blog rather than editing the existing file. Oh, he also turned me on to 1Password. I walked wondering what else I was missing. Then, I checked out the posts from today’s Reddit AMA with three MIT computer scientists. There’s a lot there–for instance, they recommend Scratch as a great starting programming language–but so far, I’ve only gotten through the answers to the question about the tools they use to organize their lives. I have a little bit of a fascination with how people work. Evernote was by far the most popular tool and I feel like I know a fair amount about using it. But I realized that knowing and doing are two different things. I am not afraid to say that I still use a pencil/paper to do list but I think it’s time to leverage Evernote to become more effective in the planning area. Then, I saw the post on the AMA about getting a text message with reminders from Google. I don’t use Google tasks but I think this feature might convince me to start. I have been learning more about the joys of texting. I have tried to be less obsessive about checking my email, particularly on the weekend, so getting a text message to remind me to water the plants that I’ve brought in for the winter would be very helpful. As for email, I am definitely a bit obsessive, and I sense the need to get it under control in terms of the role it plays in my daily life. And while I don’t think it causes me stress, it does interrupt my flow and, maybe more importantly, it enables others to use email as an “emergency” communication tool. Because folks know I am almost always in email, they send emails when they really should call or text. My worry that I’m going to miss one of those emergency emails makes me even more obsessive. I tweeted today that my first 2015 resolution was to check email three times a day. But I may start right now and then have a head start on the new year. My other resolution is to schedule time each week to explore the tools I’m using and learn more about how to use them to support my productivity.